Over the counter tanks like the Kanger Sub Tank Nano and Aspire Nautilus have brought sub-ohm vaping to the masses. All you need is a mod that can kick out enough power –– upwards of 20W, or there abouts –– and you’re away. 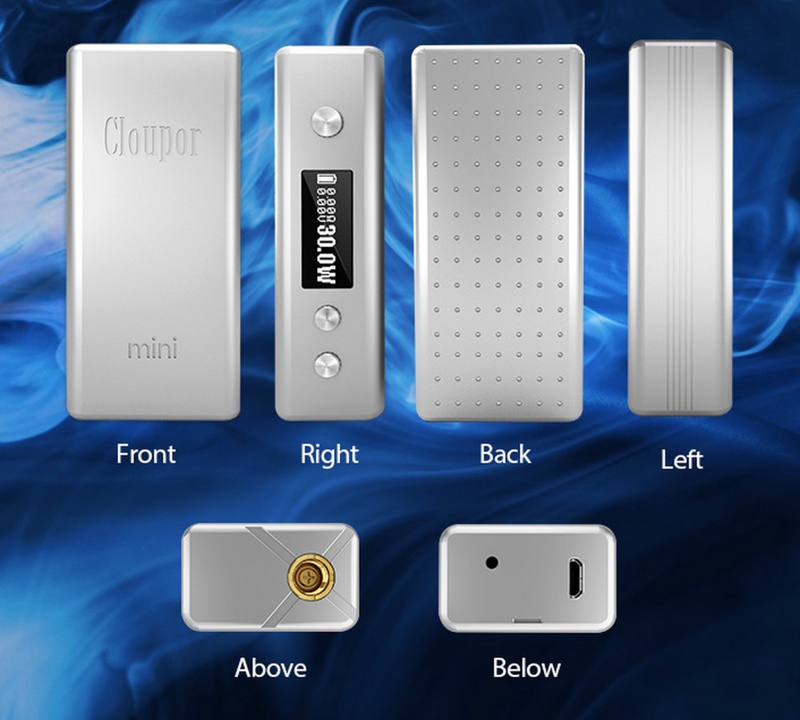 One of the most intriguing mods currently doing the rounds is the Cloupor Mini. The reason this setup is so appealing is two fold: 1) it looks awesome great and 2) it costs a lot less than you might imagine. I picked mine up for under £40, making it significantly cheaper than both the Innokin MVP 3 and the VaporShark DNA. Is this the box mod for you? Let’s bloody well find out. If you’ve bought a Samsung smartphone during the past several years, the packaging the Cloudpor Mini comes in will look VERY familiar, as it is almost identical, right down to the tacky, faux-wood paneling cardboard material. The inside is decked out in machine-cut foam and safely houses all the Cloupor Mini’s bits and pieces which include a carry case, the unit itself, a mini screwdriver, a single USB charing cable and a spare set of screws. 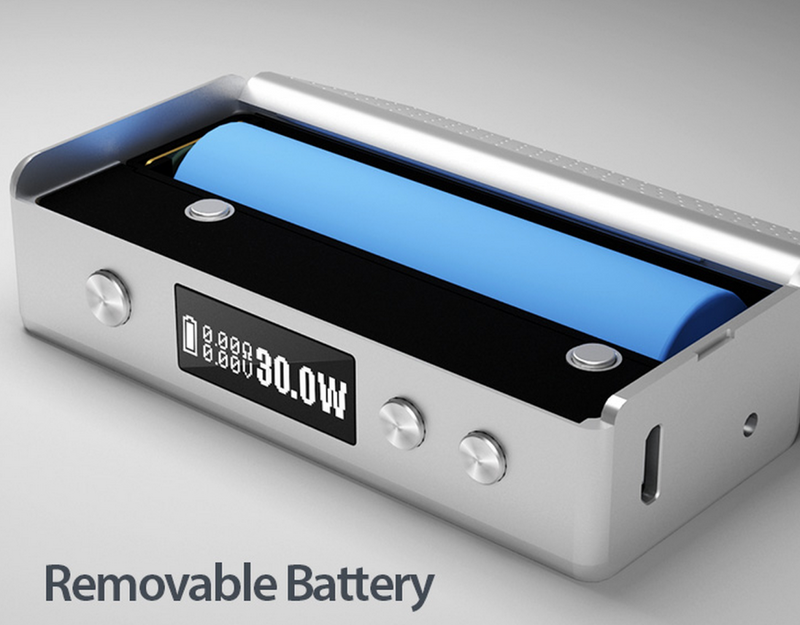 You DO have to buy your own batteries for this mod, however, as none are supplied in the box. I’ve been using LG and Samsung units for the past month; both of which can be picked up online for under a tenner. These are full rechargeable units and are good for 500 cycles. Once charged you’re looking at a solid day’s worth of action before you’ll need to plug in and top up again. Small. Compact. Beautiful. Easy to use. Simple. Elegant –– all of these things ran through my mind when I first unboxed and handled the Cloupor Mini. The mod truly is a thing of beauty. Understated, simple and straight to the point. I mean, just LOOK at it. And, no, that’s not faux-metal plastic. What you’re looking at is a mod constructed entirely from aluminium. And the end result is very compelling –– the Cloupor Mini looks and feels like it should cost a lot more than its humble £39.99 price tag suggests. Think VaporShark DNA-levels of premium-feel and you’re getting pretty close to what Cloupor have pulled off here. The unit is exceptionally well proportioned too and sits squarely and firmly in the palm of your hand, making it great for vaping literally anywhere. It has a nice weight to it once the battery is loaded and it doesn’t take up too much room in your trouser or coat pocket, leaving plenty of room for a massive tank –– I’m using the Kanger Sub Tank on mine at present. The display is perhaps a little bit on the dodgy-side of OK, but it does get the job done well enough. All of the settings –– current wattage, voltage, atomizer resistance and battery life ––are easy to see on the panel and, because it is backlit, you can use it in the dark and see what you’re doing. Handy when you’re vaping in bed or alone on a moonless night in the woods with an owl. I haven’t been able to compare its accuracy to other, more expensive setups just yet as I do not have any to hand. But a lot of trusted sources I have spoken to swear by this mod for near-perfect atomizer resistance and voltage reading. It even does it to two decimal places (1.25ohm), unlike the more expensive VaporShark DNA, which prefers singular spacing (1.2ohm). What I really do like about this unit, though, is how clear it is when something goes wrong. There are an entire myriad of error messages that display on the screen when something’s not right. 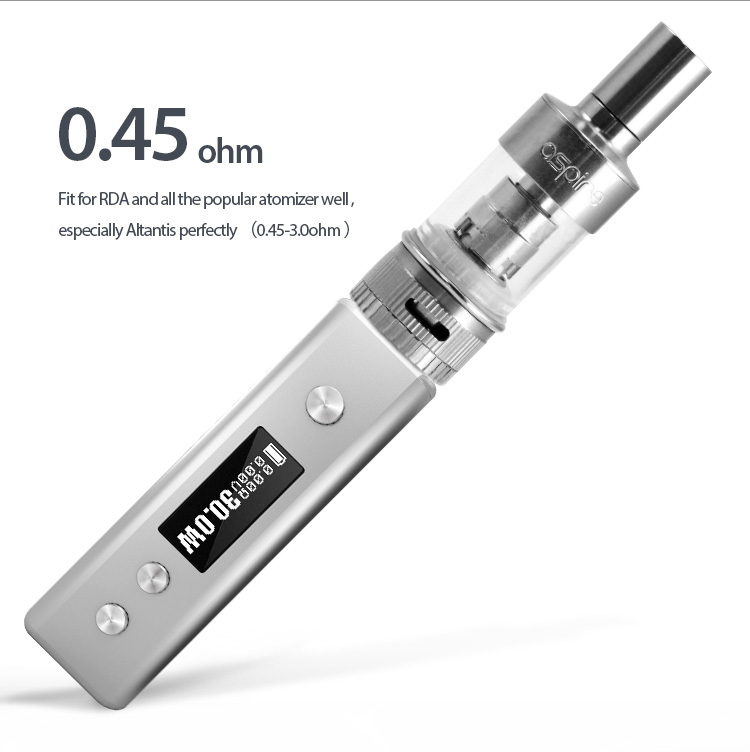 Examples like Check Atomizer, Shorted, Low Power, Too hot, and Too Low Power Setting save you oodles of time when confronting an issue by letting you know right away what is wrong with the mod. It’s a small thing but a nice touch all the same. 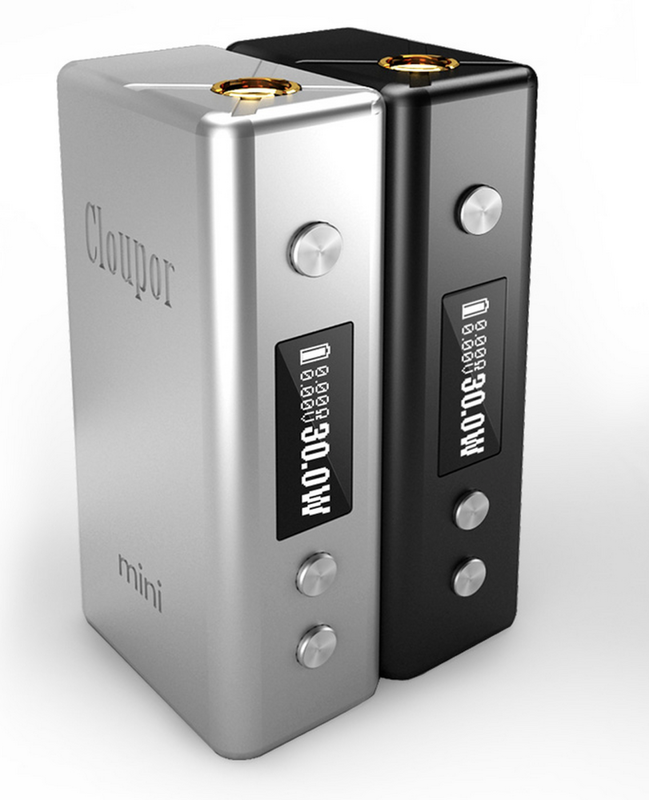 The Cloupor Mini is 510 compatible, with a twist (quite literally, in fact). And this is one of my chief complaints about the device. In order to accommodate a wide variety of tanks, Cloupor has made the screw adjustable. So, if you connect a tank and get the “check atomizer” message, you know you have to fiddle around with the screw (make it tighter or looser) in order to ensure it is properly touching the tank’s connector thread. I love this mod. I really do. It’s cheap, looks great and is packed with tons of useful features like the ability to lock settings, auto-sleep mode, whereby the display kills itself after two minutes of inactivity, and, of course, its switchable variable voltage/variable wattage mode. If you’re after value for money or shopping on a budget this is one mod you’ll definitely want to take into consideration. For me, it ticks almost all the boxes on my list for what a mod should do. Obviously there are better options out there but, pound for pound, you’re really going to struggled to find a mod as capable as this. There is one quirk which took me a while to get used to, though: the firing mechanism. 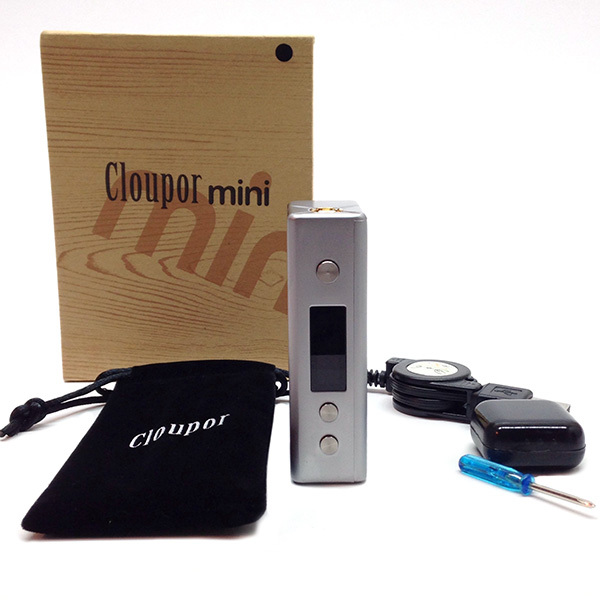 The Cloupor Mini does not fire instantaneously, you see. Instead, there is a 0.8 second delay between your pressing of the button and the atomizer coming to life. It’s noticeable, too, but handily –– or conveniently, I can’t decide –– it is about the same amount of time it takes to bring the drip-tip up to your lips, providing you fire the key as soon as you pick it up. I don’t know if this a design feature or a design fault, but it is something that definitely took me a while to adjust too. I’ve never come across a mod with such a weird quirk, but given the price and EVERYTHING else we’ve talked about above, this alone can hardly be considered a deal breaker. I mean it still does A LOT of awesome stuff and only costs £39.99. So what if there’s a slight delay on the firing key, right? As I mentioned earlier, the Cloupor Mini does not ship with a battery. This means you have to get your own in advance (or after, it’s entirely up to you). You’ll need a single 18650 mAh battery and these can be picked up online for around £8. I currently use LG and Samsung units, which are can be fully recharged 500 times before you’ll need to get replacements. Once fully charged, the Cloupor Mini is good to go for a good day’s worth of heavy vaping, though you may want to ensure it is topped up every night to ensure you’re not left hanging should you decide to go out for drinks after work. And because the batteries are removable, you can carry a couple of fully-charged spares on your person for hot-swapping on the move. I always have a couple of fully-charged batteries laying around, so when one dies I simply pop a fresh one in and stick the dead cell into my wall-mounted battery charger. This way I don’t have to worry about running out of power if and when a battery goes on the fritz. What can I say, for the price the Cloupor Mini offers excellent value for money, a great vaping experience and plenty of added extras to boot. I keep comparing it to more expensive setups, and this should tell you a lot about just how good this thing actually is… You DO NOT have to spend £100+ on a unit to get a decent experience. Not anymore. Sure, there are better mods available, the VaporShark DNA, for instance. But for this price –– £39.99 –– the Cloudpor Mini really does take some beating. It looks great, performs solidly and is perhaps one of the best mods currently available at such a low price point. I cannot recommend this unit highly enough. Co-founder and Editor of VapeBeat. I make the words. Best RDAs. 2019's Finest RDA Tanks. Period. Best RTA Tanks. The #1 RTAs For 2019. 2019's Best E-Juice List Our Picks For Early 2019. 100$ Legit Juice. GOON RDA or Kennedy 24 RDA | Who’s The Greatest of ALL-TIME?